Bollinger's All-Electric SUV | Valet. It's rugged. It's smart. But it ain't fancy. And that's the point. Just because you want to tear down rough or muddy back roads, go camping or haul some wood doesn't mean you're not interested in an electric car, does it? In fact, it stands to reason that if you enjoy all those things, you're even more inclined to appreciate and desire a more environmentally-friendly mode of transportation. And this just might be it. American automaker Bollinger Motors just introduced what it's calling the world's first all-electric sport utility truck. 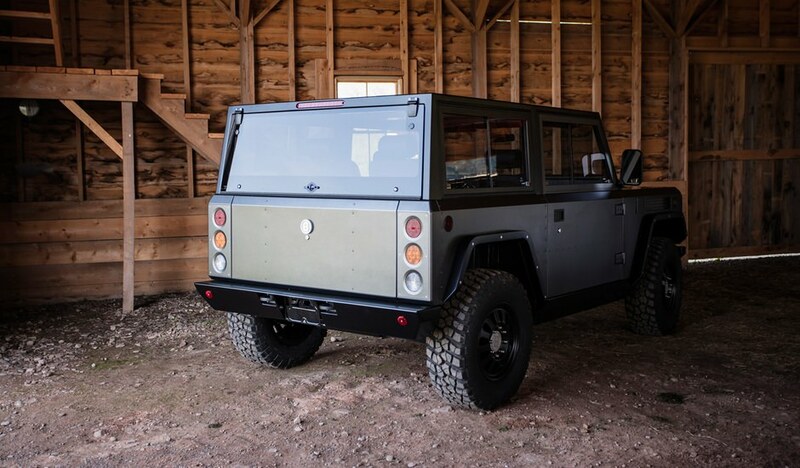 Dubbed the B1, it looks like the love child of a vintage International Harvester Scout and a Land Rover Defender. The interior is sparse but stylish. There are no touchscreen monitors or digital displays. No, this rugged ride is kitted out with an old school speedometer, along with analog dials and battery level indicators. 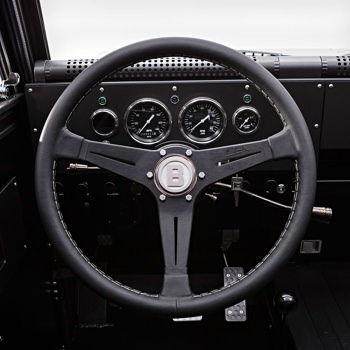 Utilitarian, yes, but not uninviting—the interior is made more enticing with comfortable leather seating for four, a leather-wrapped steering wheel and a marine-grade, Bluetooth-enabled stereo system. There's room to store 95 cubic feet of cargo if you remove two of the four seats. And plenty of power to hook up your devices, camping equipment, power tools or whatever your adventure calls for. "Since the B1 is an all-electric truck, it's really a portable energy source," says company founder Robert Bollinger. "So we put 100 volt plugs throughout the truck so you can use it to power whatever you might need out in the field." USB and 12 volt plugs are also integrated into the dash. The cab is convertible, so take off the top and remove the seats, even the doors, depending on your adventure. And under the proverbial hood? The 360 horsepower truck has all-wheel drive and a top speed of 127 mph. The powertrain is powered by a water-tight 100 kWh battery that'll have the potential for a 200-mile range—just under Tesla's 215 mile-per-charge estimate for its much smaller Model 3. Another option for the B1 is a 60 kWh battery, which would offer 120 miles per charge. Still plenty of juice for a big, badass work truck. Manufacturing of the sport utility truck is still being finalized, along with the final pricing, but Bollinger aims to land on a number appropriate for a "nicely equipped sport utility vehicle." The company is also looking to open dealerships in major cities across the US. Right now, you can reserve a spot online with no money down, and early next year reservation holders will be able to order their B1 with a $1,000 down payment. Don't get stuck with a boring fleet car. Choose a ride that fits your trip. Details on the new car the world's greatest spy will be driving.